Gen2-MTU Holsters for Semi-Automatic Handguns with cutout for MOS accommodation can be used with handguns with or without most small mounted reflex style optics mounted. 1- Cut behind the grip for a smaller “footprint’ and ease of draw, and notched out around the area where the optic is mounted so the handgun can pass into the holster without interference of the optic. 2- Doubled up, inset, tightly woven elastic retention strap for a secure carry and a lightning fast release. 3- One or two magazine pouch options which are oriented at a 90 degree rotation from the original design, which allows the individual a more fluid magazine change out. Additionally, the magazine pouch(es) have been created to hold a wider variety of magazines within the size range of the holster purchased. Large Auto with one mag pouch– Fits most service and standards semi-Autos including: Glock models 17,20,21,22, and 37, HK 45, S&W M&P®9. 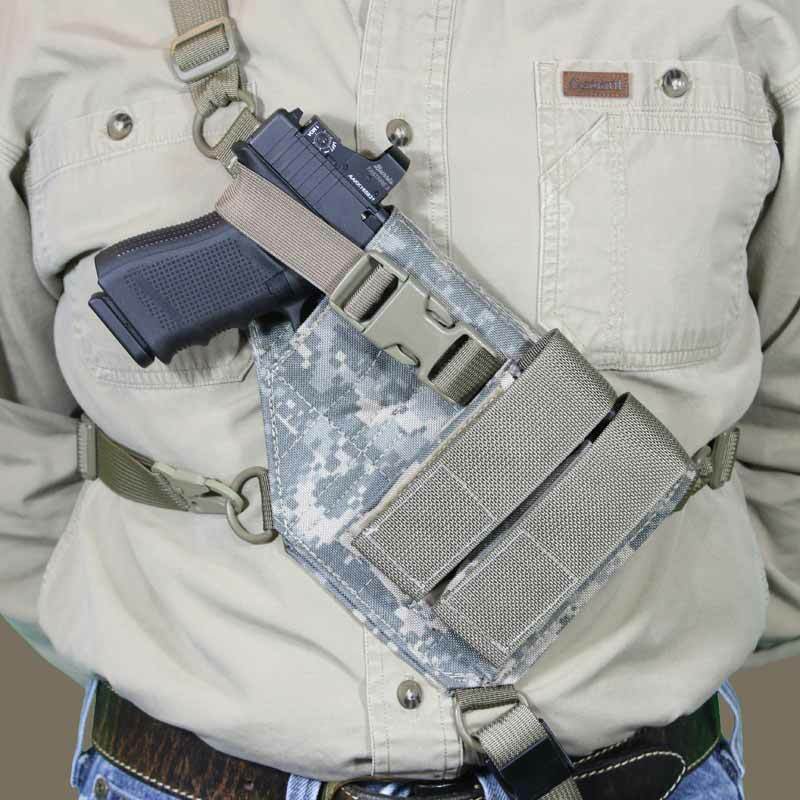 Large Auto with two mag pouches- This holster has 1- ½” additional length compared to the one mag pouch option. It will still accommodate most service and standard semi-auto handguns, but specifically designed for the Glock model 40 with the 6” long slide as well as the competition models and aftermarket barrel extensions. The additional pouch is being found by many customers to either accommodate more rounds as well as other accessories such as mag lights, multitools and knives! Available Sizes: Large One Mag Pouch (89.95), Large Two Mag Pouches ($10 added charge). Available colors: Black (no additional charge), Coyote brown ($10 added charge), Universal Digital Camo with tan webbing ($10 added charge).